In the wake of The Little Mermaid's 25th anniversary, Screen Junkies has gone ahead and given the beloved Disney animated classic the Honest Trailer treatment. "But what could anyone find wrong with The Little Mermaid," you ask. This video answers. "Look pretty, surround yourself with friends who are dumber and fatter than you, abandon your family to marry a guy you just met, and if you're not happy with the contract you signed without even reading, get your fiancé to murder the person who outsmarted you." Screen Junkies takes a similar approach to this Honest Trailer as they did for the Frozen one, in re-writing some of the songs to poke even more fun at the film. 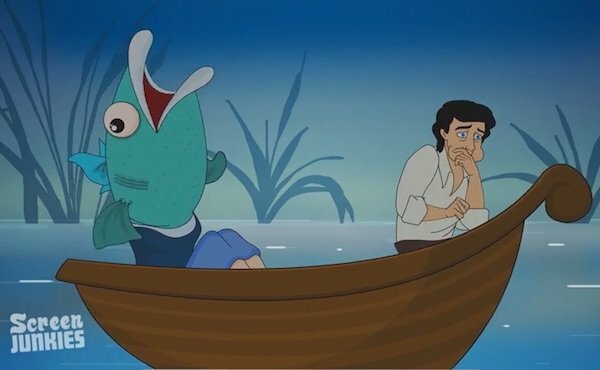 In the case of The Little Mermaid, "Part of Your World" focuses on Ariel's cluelessness, while "Kiss the Girl" just makes Eric (and an entourage of aquatic mood-providers) seem a bit creepy. And Ursula's "Poor Unfortunate Souls" reminds us that the villain's song always gets skipped on the soundtrack. The trailer also draws our attention to the morbid contrast between the gleefully catchy "Under the Sea" where everything's better down where it's wetter, and the darkly humorous "Les Poissons," where a French Chef happily butchers sea life for the humans. Seriously, Ariel, you really want to live on land? Don't expect your friends to come and visit anytime soon. They're all on the menu. Eric's totally not into it, but I'm picking up on some major sequel potential here.